Kurt of Gerolstein: The four last songs … by Brahms. The four last songs … by Brahms. CANDY ON BONE: Foodie heaven on my mind! Tonight was my last concert for the Berlin season. Well, we fly out in ten days for the sandy beaches of Australia. Goodbye Kultur, hello relaxation! Of course, that last concert had to be at the Pianosalon..
You know, when first I came to Berlin, I went everywhere. Tried loads of restaurants, theatres, concert rooms … now I don’t. I just go back to my favourites all the time: the Katz Orange, Bötzow Privat, Asman. The Deutsche Oper and the Piano Salon. Tonight it was dinner (chicken with ginger chick peas) at Asman, a taxi in the rain to the Uferstrasse … and … oh, to see the old Pianosalon turned into an Adidas shop! Shades of Bernard (ugh) Tapie! But where was the new Pianosalon? Only a few metres away. It’s different. It hasn’t yet got the grease of the years on it. It’s a slice of warehouse with the wonderful character and artefacts of the old place, for the moment, rather tacked on. But it’s a work under development and … yes … it has one or two definite advantages over the dearly beloved old place. Notably and largely … the accoustics! Paul noticed as soon as we walked in (bloody musicians .. how?). I found out after two sung phrases! Well, anyway, we were here for another Liederabend. 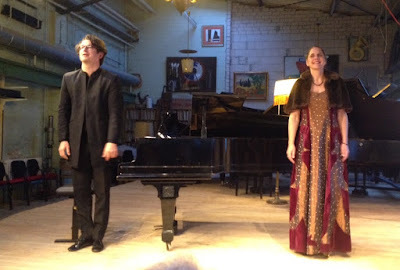 Our ‘farewell’ concert at the old house had been one such – just over a month ago – and tonight it was another by the same two admirable Lieder artists: Britta Schwarz (mezzo-contralto) and Daniel Heide (piano). But it was not the same show. Tonight was an entire evening of Brahms songs. Well, I know the odd Brahms song, duet … but this was going to be mostly (as usual) virgin ground for me. I’m not going to talk about the artists. I did that in my May 16th notice (Follow the Lieder) and I will confirm everything I then happily said with bells on. But adding that the lady’s voice came over so much better in this new room. Or else she was having a fabulous night! Heide always has fabulous nights. The first half was made up of the five Volkslieder (I loved ‘Schwesterlein’, Paul voted for ‘Da unten im Tale’), the five Ophelia Songs, and half a dozen single songs. The ‘Am eine Aolsharfe’ I found really beautiful, but of course we all went Brahms for the first-act ender ‘Meine Liebe ist grün’. At last! A song I knew! If I criticised this pair’s programme construction last time, this time it was bang on! Interval on a classic! But I had a surprise coming. Second half. Four introductory songs (I thought I knew ‘Mainacht’, but it must have been someone else’s) and then the pièce de résistance: the ‘Vier ernste Gesänge’ opus 121. I had thought I recognised the titles … but when the first chords struck up, I went into time warp. Vier ernste Gesänge? Oh heck, that’s the four serious songs … which I sang on New Zealand radio some fifty years ago! I had never thought of their being sung by a lady. Needless to say, I revelled. She sang and he played them impeccably. But oh! I longed to burst into song. Which would have been a very bad idea. They are superb songs … and to have them sung by someone who really services the composer and the poet … they brought the delightful evening to a superb climax. And then Ms Schwarz gave the Wiegenlied (and only that) as an encore, with ... yes! Her lilies at her breast! Lovely.